Wherever you look in Denver, there are plenty of plantation shutters choices. And when you want to know which non-wood shutter is best for you, some differences may be tough to recognize. You can pick the wrong type without knowing and find yourself investing in low quality shutters. When it comes to solid polymer shutters, like our best-selling Polywood® shutters, are they worth more than hollow vinyl or MDF (multi-density fiberboard) shutters? Learn about the three ways Polywood shutters are preferred over composite shutters in Denver, Colorado . Polywood shutters are crafted from high quality solid polymer that leads to the most durability, rigidity, and color-retention than any other shutter on the market. This means the shutter louvers will not chip as long as they’re on the window. However, composite shutters are constructed from a pressed-board core, encapsulated in poly-vinyl. The vinyl covering the pressed board also peels away from the core material easily. And this peeling is accelerated in humid, wet, and hot surroundings. Hollow vinyl shutters are another option for non-wood shutters. But they disintegrate the fastest because of the substance. Both kinds of non-wood shutters are susceptible to deterioration and warping when you consider all the weather conditions in Denver. Polywood is built with UV inhibitors that divert heat. And because heat is the biggest culprit in splitting the shutter louvers, Polywood is absolutely the highest quality plantation shutter for your home. Polywood shutters colors include three exceptional white paints. We bake the paint finishes on each component at hot temperatures that exceed any temperatures Denver could experience. This patented finishing process includes UV inhibitors which guarantees the color will never fade. Other types of non-wood shutters are available in low quality paint finish. And some composite shutters won’t even have any paint finish at all. In most cases, the vinyl layer is the final color. Although it looks good when installed, this finish fades over time. And as to hollow vinyls, some are painted. With the vinyl being a heat conductor, this negatively influences the finish over time. Third party testing shows that Polywood shutters shield against 30° of temperature and result in a reduction of heat transfer by up to 45%. This means that Polywood insulates up to 70% better than the top solid wood shutter. Polywood’s insulating properties are a result of the solid polymer material. Yet what makes Polywood even more energy efficient than composite shutters is the weatherstripping on the louvers and panels. 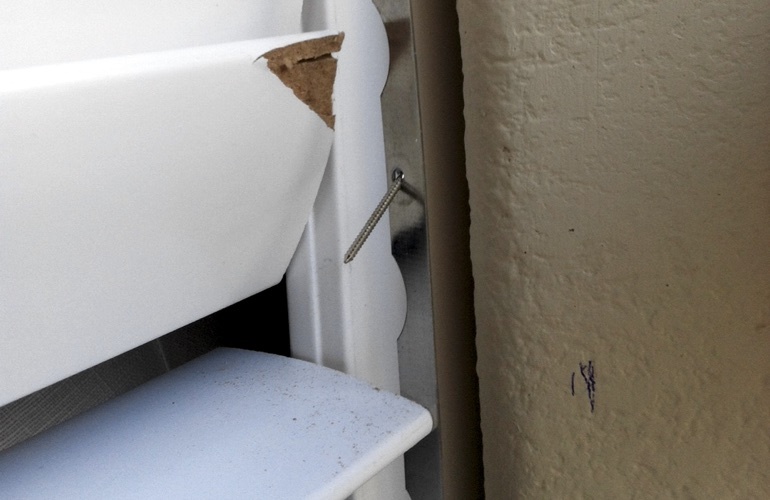 Just interlock the pieces of weatherstripping as you close the panels. This gives you a very tight seal against the impact of the weather outside. No composite shutter can offer the energy savings that Polywood does. Back in 2004, Sunburst Shutters Las Vegas had Polywood shutters fastened to the sides of their trucks as part of the graphics. The trucks were parked outside and withstood the weather Vegas is known for. That’s excessive heat for five months out of the year! The shutters had been fastened to our vehicles for almost 7 years. Our team organized an investigation on how well Polywood retained the color painted on it. So we dusted off the Polywood shutter that was on the truck. And we held up a new Polywood shutter next it for comparison. We found the color to be unchanged. There was no fading or discoloration. It was further validation for us that our paint finish is indeed the best around! And since Polywood can endure that much heat damage on the side of a truck for 7+ years, it’s without a doubt the long lasting shutter for your residence in Denver, Colorado. Interested in learning more about Polywood shutters? Call 720-538-0182 for an in-home design consultation. Our experts show you all the louver sizes, frame styles, and color options available. We take measurements of your windows to give you the most precise shutter estimate. And when we install your Polywood shutters, they will fit your window beautifully. Our specialists also share with you the specifics of the lifetime warranty available on Polywood shutters. Call 720-538-0182 or fill out the form below to schedule your free in-home design consultation today!